Published Nov 19, 2015 by Addison-Wesley Professional. Part of the LiveLessons series. 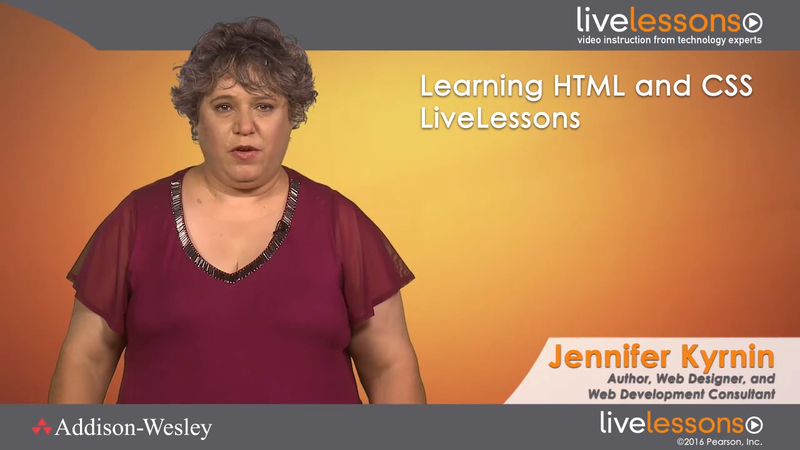 Drawing on her experience helping thousands of people learn HTML, XML, and web design, Jennifer Kyrnin guides you from the absolute basics all the way to creating responsive web layouts and beyond. One step at a time, you learn how to create and post HTML to a hosting service; build a basic HTML document; write a CSS style sheet; use internal and external style sheets; build and style HTML text; create HTML5 outlines; adjust fonts and typography; choose and change colors; create CSS3 rounded corners; and even add HTML5 web video and audio. Everything's organized into bite-sized, self-contained lessons, so you can learn key HTML and CSS skills quickly and easily.